Virtually any organization can go through the motions of creating and implementing processes that comply with ISO 9001:2000's requirements. The true challenge is ensuring that such compliance consistently adds value to the organization and helps it achieve its business goals. Taken together, ISO 9001:2000 and ISO 9004:2000 provide excellent models for organizations creating quality systems tailored specifically to their needs. ISO 9001:2000 offers a basic quality management system focused on meeting customer requirements. Using this standard, organizations can build more robust systems to improve business results. ISO 9004:2000 enhances a basic QMS by focusing on continual improvement. But to move beyond simple standards compliance toward measurable, profit-improving success requires an understanding of how "the business of business" interacts with management theory. When making the transition to ISO 9001:2000 and/or ISO 9004:2000, organizations can adopt three strategies to build quality and excellence into their business routines. They can align quality and business objectives, use process management techniques and integrate continual improvement activities into their business plans. Let's look at each of these in detail. ISO 9001:2000 requires that an organization's quality policy provide a framework for reviewing the company's quality objectives. The policy should give an overall direction for the organization, and its objectives should flow in that direction. But because of outside forces such as customer requirements and market environments, business conditions can--and often do--change. When this happens, the alignment between quality policy and objectives can become skewed. Thus, the standard requires that management periodically review changes to both the policy and objectives. An organization's objectives must be measurable and its QMS processes designed to meet those objectives. So far, so good. Aligning the quality policy, quality objectives and QMS processes should further top management's intent with regard to quality. There's only one small, potential difficulty: ISO 9001:2000 doesn't address aligning the quality policy and objectives with other business goals. What happens when the quality policy and objectives aren't consistent with those goals? In such cases, confusion about accountability could arise, and the organization's quality objectives might become little more than responsibilities assigned to the "quality department." Resource allocation can also be a problem when middle managers attempt to accomplish goals that aren't in synch with quality objectives. An organization's overall business goals, quality objectives and quality policy are all interrelated and must work together to achieve business improvement. To do this, it's necessary to understand which processes are key to achieving business goals and align those processes with the quality objectives. This step isn't specifically mentioned in ISO 9001:2000, but it's implied in clause 7.1, which states that appropriate measures should be developed for process goals. A simple example is given in the table on page 41. If, for instance, a key business objective is to increase the margins on certain products, several courses of action are available. An organization might decide to reduce costs while improving customer satisfaction. This would enable it to retain the cost savings as profit. Alternatively, with improved satisfaction, customers might be willing to pay for the additional margin. 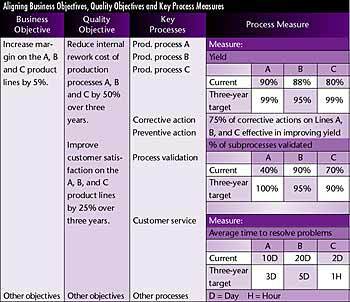 The example on page 41 shows how the cost-reduction goal (i.e., the business goal) can be aligned with quality and process objectives (i.e., improving customer satisfaction). A similar alignment could be developed for improving customer satisfaction once the key factors influencing satisfaction are determined. Although it's important to focus on product realization processes, other processes in the system shouldn't be neglected. During the development and aligning of objectives, it's important to keep customer needs in mind. Clause 5.4.2 of ISO 9001:2000 requires that an organization plan its quality management system to meet both the quality objectives and the requirements of clause 4.1. This clause requires an organization to identify its QMS processes, determine how they interact, determine the criteria and methods needed for effectively operating and controlling the processes, and provide the resources to do so. The organization needs to monitor and, where appropriate, measure the processes. And this information must also be analyzed to determine what further actions are needed to achieve planned results and improvement. These requirements describe a fairly comprehensive set of process management activities. Implementing them in a systematic manner to bring about improvement means more than merely understanding and documenting a system's processes. It means aligning business goals, quality objectives and process measures to create real improvement. And it means using process mapping, at least for the key processes, and simple flow charts for those that are less important. Process mapping involves more than just flow charting. Among other things, it can manage and improve processes by illustrating process measures as well as process flows and interactions. One process-mapping method begins by involving the people who work in the process. Another entails mapping the process as is, taking action to improve it and then preparing a final map of the improved process. Determining the process outputs should be the first step in this second method. For this, a team should consult with process customers, both internally and externally. What do they need, expect and want from the process? How can these requirements be measured, and what are the current results? The same activity should be conducted for process inputs, this time consulting with process suppliers. After the inputs and outputs have been defined, a flow chart can be prepared using normal flow-charting techniques. Make sure the flow chart shows the process as it is, not as it should be. Once the flow chart has been created, it might be necessary to measure some of the individual activities within the process to provide a full picture of performance. Analyzing a process can provide insight for improvement. The table on page 42 summarizes some of the possible opportunities that may be discovered. Once actions have been planned to improve a process, the process map should be redrawn to show the new flow and data. While any needed improvements are implemented, it's important to audit the process to ensure that the changes are fully implemented and that any gains aren't lost over time. The full process-mapping technique is appropriate for key processes, but flowcharts suffice for other processes. In these cases, some data collection and analysis is appropriate. Finally, as overall business and quality objectives are refined over time, remember to review and update process targets. ISO 9001:2000 requires that an organization use its quality policy, objectives, audit results, data analysis, corrective and preventive actions, and management reviews to continually improve its QMS's effectiveness. Some managers will wonder, no doubt, how much improvement is necessary for minimum compliance. These people are likely to comply by taking simple actions that, while improving their QMS, may have little positive impact on their businesses as a whole. Those who want measurable business results will go beyond the minimum by integrating their improvement activities and focusing on meeting quality and overall business objectives. Real improvement isn't accidental. It requires effort and generally takes place on a project-by-project basis. Recognize that there are two types of improvement: incremental and breakthrough. They have different characteristics, some of which are described in the table below. ISO 9004:2000's clause 8.5.4 and Annex B discuss these concepts in more detail. At this point, it's helpful to clarify the difference between corrective and preventive actions, two standard tools used in the continual improvement process. Corrective action addresses an undesirable situation's cause in order to prevent its recurrence. Preventive action, by contrast, addresses the probable cause of a potentially undesirable situation. It's also important to rethink the way we view corrective and preventive action. Because corrective action involves determining and correcting causes of undesirable situations, it should be considered part of the organization's overall problem-solving process. As an added benefit, integrating a corrective action process and other problem-solving activities simplifies training and focuses everyday activities on important issues such as optimizing resources. Each corrective-action activity should be recognized as a project for improvement, and the resources devoted to each project should be commensurate with the problem's importance. Preventive action should also be rethought. True preventive action identifies failure risks, prioritizes them and acts to prevent their occurrence. ISO 9004:2000 calls this concept "loss prevention." It's best accomplished when new products or processes are developed or when new equipment is purchased. Using tools such as failure modes and effects analysis and asking "what if" questions when new developments are undertaken are the keys to integrating and achieving continual improvement. John E. (Jack) West leads the U.S. delegation to the ISO committee responsible for the ISO 9000 family of standards. He is a quality excellence business consultant with more than 30 years of experience in various industries. West can be contacted at jwest@qualitydigest.com . Letters to the editor regarding this column can be e-mailed to letters@qualitydigest.com .